On this date in 1882, German immigrant William Heilwagner hanged for murdering his daughter-in-law outside Davenport, Iowa. There was little doubt William resented his son’s wife Annie — “the low livedest thing around” he said on the day of her death. This sportive lass yearned for recreation not to be found on Midwestern onion farms, and the neighbors heard the triangular family dust-ups that resulted. There was not a whit of direct evidence against the defendant, but since Otto was out playing pinochle that night, it really only left one suspect. After the inevitable conviction, a greenhorn aspiring journalist from Davenport, one Charles Edward Russell, took an interest in the queer case. William Heilwagner’s behavior unsettled him; Russell pressed him for a jailhouse interview. As described in Russell’s 1914 memoir, These Shifting Scenes (available free here), the taciturn Bavarian gave Russell nothing but aggravation. It’s enough to drive a body to distraction. Between the prisoner’s feeble story and apparent disinterest in his fate, Russell figured the old weirdo did it — discounting Heilwagner’s scaffold declaration of innocence. “Gentlemen, I am innocent of this crime.” Not one of us that heard believed him. What guilty man is ever punished? What murderer, however hardened, or however certain his crime, fails to protest on the gallows in the like terms and with the same hardihood? All the experienced reporters there told me they had heard such assertions often on the like occasion and were moved not a whit. Ten years later, Heilwagner’s son Otto leapt to his death from a bridge in Quincy, Illinois. Otto left behind a suicide note confessing to the murder of his wife: he had secretly rowed back to the house in the dead of night, enticed Annie out of the house, and murdered her for infidelity. Heilwagners, father and son, kept their peace about the secret while William hanged. It was a rugged introduction for a novice to the business of crime detecting and legalized life-taking. If I had been expert at my trade I might have saved that man. Post facto illumination — how foolish it is! I can see now the indications and signs and hints that meant nothing to me then. But even though I knew at the time nothing of the full horror of that day the experience sickened me of hangings. I have never since acquiesced in any capital punishment. It is as illogical as it is profitless. I have had in my time more than my share of these spectacles and I take it as a fact worthy of serious reflection that I have seen the state put to death eleven persons and five of these I know to have been absolutely innocent, while of the guilt of a sixth and the mental responsibility of a seventh there were the gravest doubts. Murder upon murder, and if I should be asked what good or advantage society reaped from the death of any or all of these, I should be unable to say, nor has there yet appeared in my range of experience any person more expert than I to make that answer. 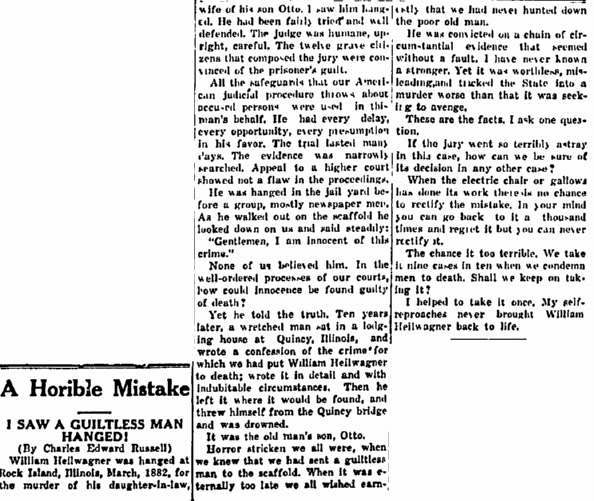 Among the innocent Russell reckoned were the Haymarket martyrs, whose hanging he covered a few years later for Joseph Pulitzer’s New York World. His keen sense of injustice — and a somewhat better-developed nose for a story — led Russell on to a career as the “prince of muckrakers,” credited with some of the signature coups of turn-of-the-century journalism, and a place on the masthead as a co-founder of the NAACP.